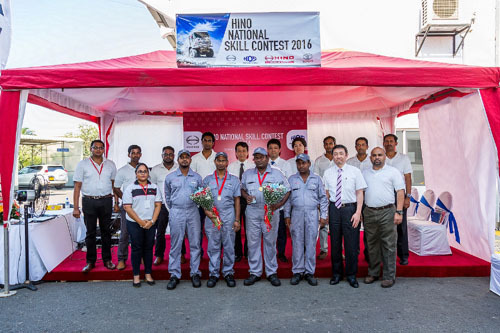 Toyota Lanka being the national dealer distributor for the TOYOTA and HINO brands in Sri Lanka, and a member of Toyota Group (Japan), successfully inaugurated the first-ever HINO National Skill Contest 2016 (National Skill Grand Prix) recently. The primary objective of the HINO National Skill Contest is to diagnose, develop and sharpen the skills of technicians at all levels to increase the output productivity and improve the customer quality delivery for HINO at all customer service touchpoints. Being a full-day exercise, the HINO National Contest assessed the task orientation, timing of performing technical tasks, service management skills, maintaining repair standards and service delivery time.